This paper is A modification of Radic M.Z. original paper titled: “ Water Resources and the Development of Human Civilisation” for the Biopolitics International Organization (http://business.hol.gr/~bio/) 3rd International Conference: “DANUBE RIVER BONDS, BIO-ENVIRONMENT - BIO-CULTURE: Past, Present and Future” (Bratislava, June 1997). Modifications are made for the presentation on MED-HYCOS web-site in Montpelier, France, December 2000 Th. The aim of this paper is to inform the public about discoveries which can depict the history of human civilization in the Danube region and offers the elements for considering different view about the beginnings of the human civilization on the Earth, and finally, moves the limits of the beginning of some sciences such as hydrology, geometry, urbanism, civil engineering and human art. Of special importance is to note the contribution of two Serbian academy members to the world science: Milutin Milankovic, who was among the first who made it possible to explain the Earth's climate in the past and in the future, and Dragoslav Srejovic, who re-established the limits of the beginning of European civilization by discovery of the civilization of Lepenski Vir. The name Vujica Jevdjevic, first professor of Hydrology at the University of Belgrade and pioneer and founder of modern Stochastic hydrology is also mentioned in this paper. So, this paper is dedicated to these three science genius. · It is impossible to understand the present and to estimate the future, without understanding and using experiences of human civilization from the past. At last, but not least, this paper should encourage further investigations in order to complete the history of the Danube region as an important part of Black Sea and Mediterranean Sea macro catchments. The greatest old civilizations origin from the valleys of large rivers: Egyptians in the Nile valley, the Sumerians in Mesopotamia between the Tigris and Euphrates, the Harappans in the Indus Valley and the Chinese in the Huang-Ho river banks. Their development and endurance of their culture depended undoubtedly on their relation toward water. Many well-known cultural monuments and preserved inscriptions prove this. It is also known that Harappan civilization ended in a catastrophic flood of the River Indus due to tectonic disturbance. In general all four civilizations had similar geographical conditions: they were based by major rivers, rainfalls were scanty, summer temperatures were high, and the phenomena of river fluctuations were comparable (Biswas, 1970). It is less known why these civilizations remained so long, and if other civilizations existed at the same time or earlier, and, if not, why they did not survive in a such long period. A question of special importance for the Danubian countries is whether a civilization existed at that time in the Danube region, since it was a common opinion until recently that early civilizations could not sustain in central Europe due to unfavorable climate conditions. This hypothesis has been shaken soon after 1950, when intensive archeological search was initiated by Hungarian, Romanian and Yugoslav experts, and was finally proved wrong in 1965-1970 after discovery of ancient site Lepenski Vir by the Danube banks near so called Iron Gate (downstream of Belgrade). The aim of this paper is to present some of the results to a wider audience which prove that a highly developed civilization existed in the Danube valley before and at the same time with Egyptian and other well known ancient civilizations. The paper also presents some results of the studies of the climate in the past of this region, which proves favorable climate conditions in the Danube region. By the end of 20th century, possible climate changes and its impact on development of civilization has gained significant attention of the public and the scientists. Simultaneously, the past climate on the Earth is studied. Some fifty years ago, only the enthusiast and inquisitive scientists studied the past climate. One of those was a famous Serbian scientist Milutin Milankovic*. During 1930-1941, Milankovic computed temperatures for the period of 600.000 years and postulated the theory of the alteration of the ice age on Earth. His results were presented in his excellent book Canon of Insulation and the Ice-Age Problem (Milankovic, 1941). The theory is based on principles of sky mechanics and allows computation of temperatures for any point on the Earth in past and future. Milankovic also calculated long-term temperature changes at the Moon and the planet Mars. At the beginning Milankovic made a calculation of temperature changes at the top of the atmosphere. Later he calculated temperature distribution for 8 longitudes and 8 latitudes for the winter half-year period. Taking account influence of the atmosphere, he discovered high correlation (0.996) between elevation of border for snow and ice-cover and summer insulation for specific geographical position on the Earth. According to this relation it was possible to recalculate the movement of ice coverage trough time. His results initialized long and sometimes biter discussions between scientists around the world. Serbian Academy of Sciences collected 108 papers published till 1955 with 1533 citations of Milankovic. Milankovic’s theory was fully confirmed by the British and American scientists analyzing the layers on the bottom of the oceans. Later, using both types of results V.Jevdjevic at all. (1974) produced the report “Almost-Periodic Stochastic Process of Long-Term Climatic Changes“ in which Milankovic’s period is used as deterministic component for the simulation model. Extensive research conducted recently within the studies of climate changes (see e.g. ”Les grand mouvement climatiques”, Jacquet, 1990) allow a reliable estimation of past climatic conditions in the Danube region. Their results proved wrong the earlier hypothesis established by archeologists that there were no old civilizations in the Danube valley because of unfavorable climatic conditions. Fig. 1 shows some of the results (Jacquet, 1990) which support the possibility of existence of old civilizations in the Danube valley in the last 20.000 years. Fig. 1a presents the changes in boundaries of the ice cover of northern hemisphere during the last 20.000 years; Figure 1b presents the changes in temperature of the Atlantic Ocean near Portuguese coast, and Fig. 1c chows a comparison of changes in sea level and in sea surface temperature near Nantes, France. These can be compared with Fig. 1d, which gives changes in sea level near Brazilian coast in the last 7.000 years, at the time of development of the Egyptian civilization. · In the last 20.000 years today's Danube valley has been far from the boundary of permanent ice region, and the existence of civilization was possible. · Since Nantes is located at 47.2oN, and the Iron Gate at 44.5oN, it is clear that the climate conditions were relatively stable between 8000 and 3500 BC and warmer than today. · More notable changes in temperature from 4000 BC till today (with minimum values around 2800 BC) could have lead to more significant changes in water levels of Danube and to flooding of settlements near the riverbanks. If correct, these conclusions could partly explain the establishment and disappearance of the civilization of the Lepenski Vir in the region of the Iron Gate after 3-th millennium BC. The civilization of Lepenski Vir continuously existed from 11th to 3.5th millennium BC (Srejovic and Babovic, 1983), leaving behind the traces of its development to be discovered nowadays. From the hydrological point of view, the most important fact is that there is the continuity in water-related symbols in the culture of Lepenski Vir. Fig.2 presents some elements, which support this hypothesis. Fig.2a shows the most important archaeological locations discovered on the Romanian and Yugoslav banks of the Danube, which prove that it is not the question of a single location, but the large area on both banks of the Danube. 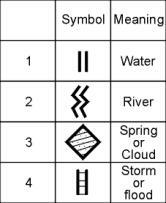 According to Marshach (1981), the civilization of Lepenski Vir had highly developed symbols of water. The early Neolithic symbols of the middle Danube valley is, in some elements, similar to those found on the Apennine Peninsula, Anadolia and Mesopotamia in the same period, but with greater number of more complex symbols. Some of the most frequently presented symbols are shown in Fig. 2b. Over the millenniums, there was a continuity of the civilization from the cave period, through the period of living by the river (period of fishing), up to the period of agriculture, when the symbolism was enriched. 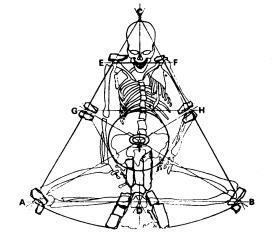 This is illustrated in the Fig. 2c. · Finally changes in water level over time (parallel lines in the developed fishing period). By further imagining, the existence of three parallel lines might be also explained as awareness of low, mean and high water flows, which could be accepted as the beginning of the history of hydrology. High degree of urbanization of settlements and pattern of the houses of the civilization of Lepenski Vir could be very interesting for the history of European architecture and civil engineering. Fig.3 presents a scheme of the organization of communication in the settlement, disposition of discovered houses and their orientation towards the Danube (Srejovic and Babovic, 1983). (Adopted and modified from Srejovic and Babovic, 1983). It can be noticed that the houses have the same structure and orientation adapted to local climate conditions, direction of dominant wind, and movement of the sun during the day. Fig. 4 shows the base of a typical house; complex geometry form was used with no acute angles. 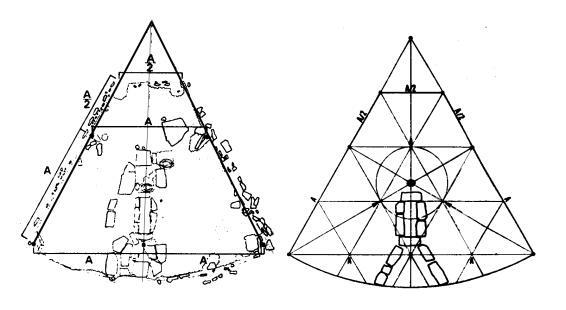 Base of the house is formed of elements of equilateral triangle and circle, which clearly shows that the culture of Lepenski Vir possessed knowledge of geometry long before the existence of the Hellenic culture, whose successors consider themselves the founders of the contemporary geometry. It is also fascinating that proportions of the house bases and the hearths are the same in all three discovered archaeological layers. There only difference is in the size of the base, which indicates that dimensions of the houses were set either according to the relevance of the inhabitants in the community, or perhaps according to the proportions of the owner of the house. First hypotheses can be, to some extent, confirmed by the fact that the biggest houses (in every archaeological layer) are found in the middle of the settlement. The other hypothesis can be confirmed in Fig. 5, comparing the proportions of the house and of the skeleton found in it (Srejovic and Babovic, 1983). By further generalization of this discovery we could conclude (see Fig. 3), that complete urbanization of the settlement may follow the same principle. 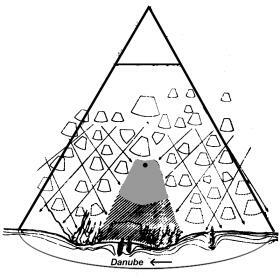 At the end we could recognize establishing hierarchy on four levels: man - house - settlement - river, or more generally, a hierarchy such as: individual - family - society - nature, which means that a philosophical ideal was reached in the culture of Lepenski Vir: living in accordance with nature. The continuity of the civilization of Lepenski Vir interrupts around 3000 BC. The possible cause of this are either frequent floods (see previous section), or increased number of inhabitants so that the settlement became too small, or maybe abandoning the fishing and moving to locations near the agricultural area. Further investigations should establish how far was the civilization of Lepenski Vir was spread and its later path. The latest archaeological discoveries in the Danube region of East Serbia (Sarkamen near Negotin in 1996), where some jewelry from the period BC was found, are one of the steps in that path, which are supposed to fill a gap up to the period of 8th to 7th century BC, when Phoenicians, Egyptians and Greeks penetrated the Danube estuary, the 6 century BC when Persian Monarch Dares the First had tried to occupy the territories adjacent to the lower Danube basin, as did Alexander the Macedonian in 334 BC, and the first century AD when the upper Danube formed a part in the Roman Empire (Stancek A., Jovanovic S. et all.,1988). Available archaeological and historical data show that the region of Iron Gate was always of great interest. From 101 to 196 the Roman Emperor Traianus built the Trainus' Bridge across the Danube in the Iron Gate, and on the right bank (now Yugoslavia) he constructed the Trainus' Road through Iron Gate, the existence of which is documented by the Tabula Traiana. The importance of Iron Gate on the Danube attracted many emperors, but at the same time it made even the greatest enemies to co-operate. An interesting fact can serve to confirm this hypotheses (Radic, 1996): in 1873, the Austrian-Hungarian-Turkish committee was formed which recorded the profiles of the Danube in the zone of Iron Gate. This committee can be regarded as precursor of today's International Danube Committee formed in 1922. Water is one of the principal resources, the driving force and the limiting factor of human civilisation development. It is essential to study available water resources in the world, and the relation between socio-economic and natural systems throughout the history of mankind. Some cultural monuments, such as the Iron Gate region of the Danube river, illustrate a century old bond between man and water. But, we must not forget the unity of water cycle in the Earth. From such, global point of view, the Danube river catchment is only the sub-catchment of the Black Sea catchment or the part of Europe, which supplies the Mediterranean Sea. The concept of sustainable development means that the water-connected problems overcome individual and local needs and became regional and global human population interest. Sharing knowledge and experience are the ways for reaching this common target. The same objectives have MED-HYCOS and all other WMO established programmes. It mustn’t be forgotten: Sharing is the greatest human happiness! The mosaic of human knowledge and experience is unlimited. One can find and add a puzzle in a proper place, other can complete a full new scene, but all of us can enjoy the beautiful picture of the mosaic. Ø Biswas, A.K. (1972) History of Hydrology, North-Holland, Amsterdam-London. Ø Jacquet, J. (1990) Les grand mouvement climatiques, La Houille Blanche, No. B1/229, pp. 19-42. Ø Milankovich, M. (1941) Kanon der Erdbestrahlung und seine Anwendung auf das Eiszeitenproblem, Koniglich Serbische Akademie, Belgrade. Ø Radic, Z.M. (1996) Hydrology today, yesterday and tomorrow (in Serbian), in: Razvoj nauke u oblasti gradjevinarstva i geodezije u Srbiji, Gradjevinska knjiga, Belgrade, pp. 237-267. Ø Srejovic, D. and Babovic, Lj. (1983) The art of Lepenski Vir (in Serbian), publ. by "Jugoslavija" and National Museum, Belgrade. Dr. Zoran M. Radic graduated from the University of Belgrade Faculty of Civil Engineering with a M.Sc. and Ph.D. in Hydrology. From 1974 to 1977, he worked for the Department of Water Supply and Purification at the "Energoproject" Engineering and Consulting Company. Since 1977, he has been teaching at the Faculties of Civil Engineering in Belgrade, as a visiting professor to the faculty of Civil Engineering in Sarajevo and Pristina, the Faculty of Meteorology in Belgrade, as well as several International Courses sponsored by UNESCO, UNDP and WMH. He is President of the Yugoslav Association of Hydrology, Member of the National Committees for IGGU and IHP, Member of the UNESCO IHP FRIEND Project International Steering Committee for the AMHY Group, Yugoslav representative to the IAHS, and National Co-ordinator for several scientific and applied projects. He participated in the UNESCO IHP Danube collaboration projects and has co-authored Hydrology of the Danube river. * Milutin Milankovic, Ph.D. (1879-1958), was a civil engineer and obtained his doctoral degree in engineering sciences, but he spent the greater part of his professional life teaching astronomy and mathematics at the University of Belgrade.